This is the best book I have read on the subject and one which I have only recently discovered. It is the best for three reasons: First, the book is so well written and communicates so beautifully about the time in which it was written as well as the time in which it is set. Second, it uses the title to introduce the reader to a shocking event which is only indirectly related to the subject but not widely known. Third, it is written - about a rather insignificant battle which has had more stories, history books and films made about it than any other - by a native American, and it shows. Just before dawn, on January 23 1870, at a time of day and year when the US army usually attacked native American villages, Colonel Baker's four cavalry companies charged into a peaceful Pikuni Blackfeet winter camp located on the big Bend of Marias River, Montana. "In a report submitted to his superiors by W A Pease, the Indian agent. Only 15 of the (173) dead Indians had been fighting men between the ages of twelve and thirty seven, while ninety were women and fifty were children." ( 33) This was a massacre on the scale of Sand Creek and an event which was so close to James Welch's heart that he wrote a full length novel about it: Fools Crow. Headlines from the Montana press aped the odious Rocky Mountain News accounts of the event at Sand Creek Colorado, referring to the Pikuni as "murderous" and felt that the result would be "peace and security". 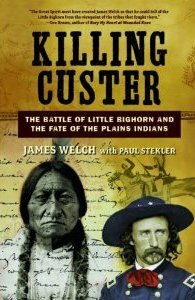 (35) James Welch asks "How does one compare this incident in history with the one at the Little Bighorn?" (44) Not unnaturally he sees both as part of the battle for the Plains the outcome of which was "never in doubt". (47) From time of European arrival in 1492 until 1900 the numbers of indigenous people in the area of the USA had fallen from an estimated 6 million to a mere 237,000. (46) "Custer's Last stand has gone down in History as an example of what savagery the Indians were capable of; the Massacre on the Marias is a better example of what man is capable of doing to man." (48) He could have added it was a perfect example of how the US authorities saw nothing wrong in holding the innocent majority culpable for the actions of a small minority, treating native Americans as if they were collectively responsible for the actions of aberrant individuals. For years native American accounts of the Battle of the Little Bighorn were discredited. As a corollary to Manifest Destiny the ability of these culturally very different people to recount what had happened in the battle was dismissed out of hand. American historians have revised their view of the American West by coming to the realisation that, in the words of the New Western History, the Frontier Thesis of Frederick Jackson Turner was "triumphal". Historians had been part of a misrepresentation of history from the cultural perspective of the culture which set out to achieve, and succeeded in the dominance of the American continent. However in the benchmark volume of the New Western History "Trails" Walter Nugent was still hidebound by the frontier thesis and the cultural preconceptions which underpinned it. Nugent was so desperate to separate US imperialist expansion across the continent from the colonial expansion of Europe across the world that he created a construct in which the old world and new world were differentiated by calling the former "frontier" expansion and the latter "imperialist" expansion. Clearly Nugent was right to in that both the New World and the Old World exploited the technological superiority gained from industrialisation to overwhelm the native populations and obtain the vast resources which would enable the elites of the imperial powers to become richer. In trying to differentiate between them he was still showing that the Frontier thesis had left its mark, as he did in referring to the five "civilised" tribes without parentheses. Just as even in even in 1991 historians professing to have recognized the errors of historians in the past were still under their influence, so too have modern historians and writers recounting the Battle of the Bighorn been influenced by the mistakes of the past in discounting native American testimony of what happened that day. This is very poor history indeed. Native American accounts are, per se, no less or more reliable than any other source. One needs to evaluate each source on its own merits and to utilize each source accordingly. Wooden Leg's account, recorded by Thomas Marquis, was discredited because Marquis was deemed to have included extraneous details gleaned from other interviewees in his book "Wooden Leg". There was no need for the baby to be propelled headlong after the bathwater. As long as such sources are used carefully, with discernment, they are very instructive, especially since much of the native American recounting of events which occurred in the Reno Fight are corroborated by army sources. So why should the Custer Fight be any different? Thus Graham offers clear support for James Welch's contention that native American accounts should be properly utilised. Yet in 1993 when his Hoka Hey it's a Good Day to Die was written, Richard Hardorff was still denigrating them. This was astonishing since his whole book - and excellent it is - was founded upon their use. "It should be noted that (the Indian combatants) frame of mind differs psychologically from that of the whites. Indian recollections are basically recountings of personal incidents which rarely present an overall view. Based on a series of impressions, these statements reflect only that which the narrator had experienced." Hardorff gives this as the reason why it is "so difficult to reconstruct the phase known as "Custer's Last Stand", and for the study of Indian casualties" because "we are confronted by insufficient data." It is difficult to take seriously the implication gained by turning his argument on its head, namely that accounts by US troopers would present an "overall view" rather than "recounting personal incidents. " Such an idea is laughable. Paul Stekler's "Afterword" is also extremely interesting, in particular because he refers to Joe Medicine Crow, whom I have seen on a BBC television programme about the Battle of the Little Bighorn . I realised that his ancestors would have fought with Custer rather than against, and smiled as he recounted what for his people had been a defeat. James Welch points out, that their alliance with the whites yielded regained ownership of the area which they still hold as part of their lands today. What I did not know was that Joe, a wonderful character, was a direct descendent of White Man Runs Him, who was a survivor of the battle. In the prologue James takes us through his surprise at being chosen by Paul Stekler to script the film Last Stand at the Little Bighorn, and his initial reluctance to engage in what was a new departure for him. Thankfully Paul was successful in persuading him to join the project, and this book shows why Paul Stekler made such a good choice, for James Welch's humanity and humour shine through. "Little Big Man " writes James, " accomplished the feat of humanizing Indians by depicting individuals living in society, with its own special structures, mores and values ". (98) In this book James Welch brings such values to a subject in which, all too often, they have been absent.